Last night Ventura City Council approved the contract plans and specifications for the Surfers Point Managed Shoreline Retreat Initial Phase project and authorized the advertisement for bids to be received by Tuesday, April 13, 2010. The Surfers Point project has now reached a major milestone with construction ready to commence on nearly half of the ultimate project. 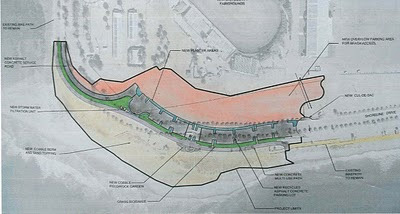 The major components of this phase will include removing nearly half of the existing damaged Fairgrounds parking lot closest to the Ventura River, replacing this parking with an adjacent temporary surfaced lot, relocating the class I bike path, placing a significant amount of the buried cobble needed to provide erosion protection for the relocated improvements and covering it with enough sand for easier access, shortening and abandoning a portion of Shoreline Drive, and installing storm water quality improvements. On February 22, 2010 the City Council approved the purchase of cobble rock and sand needed for the ... project, at a total cost of $600,000. Purchasing the needed cobble and sand up front for the initial phase of the Project would remove a large unknown factor to contractors who would be bidding on this Project and should provide the City much more competitive bids on the overall Project. The full project cost for the Surfers Point Managed Shoreline Retreat project is currently estimated at $9.6 million. Appropriations for the project are approximately $4.88 million resulting from prior grants received from the State Coastal Conservancy, State Coastal Resources, and Federal TEA-21 transportation/bikeway grants. The initial phase project that will be constructed this fall is estimated to cost $2.7 million.